Are you an Estate Sale Newbie? 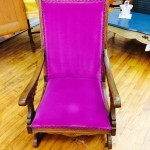 I have been attending Estate Sales for 2 years and I can easily spot an Estate Sale Newbie. I LOVE Treasure Hunting! Today, I attended an Estate Sale and experienced a “First”. 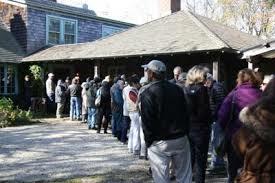 I was physically “handled” by another buyer when lining up for the official start of a local estate sale. I was number 13 out of about 100 people; many of whom arrived too late to obtain a number to enter the sale. As the worker for the Estate Sale ushered the first 20 people into a holding area, a woman (number 14), put her arms around my waist to ensure no one would cut in front of her. It shocked me as I didn’t know if I was being mugged or my life was being saved from walking into a hot pool of lava. Either way, I quickly wondered if these Estate Sale followers had ever learned Proper Estate Sale Etiquette. If not, let this be an Official Guide for the Estate Sale Newbie. The Seasoned Estate Sale Professional Buyer will arrive to an Estate Sale at least 2-3 hours prior to the posted Sale time. People travel long distances for advertised sales and many of these seasoned buyers strategically park their vehicles to be first in and first out. Typically, the first to arrive will distribute Street Numbers. Make sure when you arrive, the first thing you do is to obtain a number for each person in your party. Regardless if you are married and consider yourselves as “One”, if you only pick up one ticket (number), only one person will be allowed to enter the sale. So, remember to take two numbers for yourself and your spouse. Dress appropriately for the weather. Rain, sunshine, snow, heat, cold; make sure you are ready for the elements. Have something to do while sitting in your car waiting for the Sale to begin. It can get very boring, so bring water and snacks too. People will begin lining up about 20 minutes before the start of the sale. Try not to line up prior to 20 minutes, unless it is a beautiful day and you can withstand the elements. People will crowd around you as many will be anxious to get into line. My recommendation is not to crowd around the front door, but hang out comfortably. Don’t block driveways, cars, mail boxes, fire hydrants or Exits! DO be considerate of HOA Rules, Laws, Neighbors and Non-Estate Sale traffic. Don’t crowd the front door. Don’t RUSH! DO relax and wait for the Estate Sale Host to open the door. You’ll get in if you have a number! Don’t block the entrance! Estate Sale Workers will need to maneuver in and out the front door. DO be considerate. Don’t bring children! This is a pet peeve of mine. 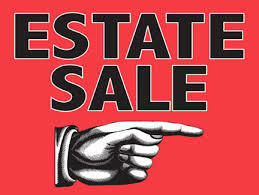 Estate Sales are extremely crowded with lots of sale items and anxious buyers. The majority of Estate Sale Buyers are aggressive and many times, pushy and impatient. This is the last place for a young child. Don’t hide your Number. Do make it visible. This helps others determine their place in line. Don’t be Rude. DO be considerate of others. If you have a conversation while in line, please note that EVERYONE will hear EVERYTHING you say. This also applies to those talking on their cell phone. Nobody wants to hear about your life. Keep conversations positive and respectful. Don’t get impatient with the Estate Sale Workers. They didn’t create the problem and are there to help solve them. Allow them to do their job. If you are dissatisfied with their performance, find the Sale Organizer and report it to them. It’s not your job to tell anyone what to do. Don’t shop from the “HOLD” table. People are allowed to store their selected items in boxes or on top of tables designated as a HOLD area. These items are considered SOLD and are not available for purchase. Remember, buyers will be very aggressive so if you try to “take their items”, you will suffer the consequences….not pretty. Don’t remove SOLD TAGS. If an item does not have a price tag, pick up the item and take it to one of the workers. If the item is too large, bring the price tag to a worker so he/she can immediately place a SOLD tag on the item. Don’t Hoard! Don’t place an item in the holding area or place a SOLD tag unless you are committed in purchasing it. Hoarding is NOT allowed and unfair to EVERYONE. DON’T STEAL! You will get caught and you will be prosecuted. DO bring your own mover(s). 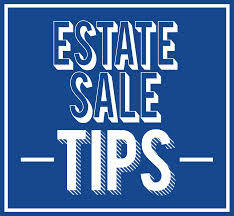 Many Estate Sale Companies will allow you to pick up larger items at a later date and time (at the end of the sale). Make sure you have your items ticketed as SOLD with your name and phone number on the tag. Keep your paid receipt, as you will need to present this in order to pick up your order. 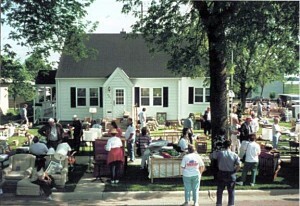 Many Estate Sale Companies will conduct Sales in 1, 2 or 3 day periods. The first day, expect all items to be at FULL Retail Prices. If it is a 1 day sale, discounts will not be considered until after a certain time. (Typically, if the sale is between 9a-4p, discounted items will begin at 2p). Near the end of the sale, all items will become negotiable. 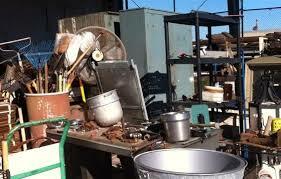 Many companies will have Liquidators to buy out the end of the sale items. When Sales are held over a 3 day period, the second day is typically at a discounted rate of 25% and the third day, at a discounted rate of 50%. This depends upon the sale and the Company. First Come – First Serve…. and many times, the Early Bird does get the Worm. As with any business, there are good and not-so-good Estate Sale Companies. The only way you will get to know the difference, is to go to a few. Buyer Beware – make sure any item you purchase is in working order…there are no guarantees. DO have fun and DO enjoy the experience. I was talking to a friend about her desire to look into estate sale services. She wants to get advice and tips from other people about their experiences. It would benefit her to know to not remove any sold tags but to simply find a worker and ask for the price.